Ecologist David Kaplan surveys dying coastal trees in the Withlacoochee Gulf Preserve in Yankeetown, Florida. Photo by Roger Real Drouin. This young male tiger died in a poacher’s trap in central India in 2012. Photo by Nitin Desai, WPSI. “We are on the verge of losing one of the most magical animal migrations,” says Dan Ashe, director of the U.S. Fish and Wildlife Service. An hour south of Pittsburgh, in Pennsylvania’s Washington County, millions of gallons of wastewater from hydraulic fracturing wells are stored in large impoundment ponds and so-called "closed container" tanks. The wastewater is then piped to treatment plants, where it is cleaned up and discharged into streams; trucked to Ohio and pumped deep down injection wells; or reused in other fracking operations. Hundreds of thousands of birds and bats are killed by wind turbines in the US each year, including some protected species such as the golden eagle and the Indiana bat. That's only a small fraction of the hundreds of millions killed by buildings, pesticides, fossil-fuel power plants, and other human causes, but it’s still worrying—especially as wind power is experiencing record growth. When it comes to the real estate market in Bradford County, Pa., where 62,600 residents live above the Marcellus Shale, nothing is black and white, says Bob Benjamin, a local broker and certified appraiser. There aren’t exactly “fifty shades of grey,” he says, but residential mortgage lending here is an especially murky situation. 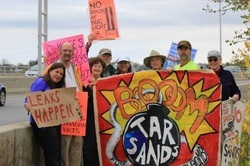 A citizens group in South Portland, Maine, is hoping to beat back an effort by Big Oil to pipe tar-sands crude through their city. The group gathered enough signatures to put an initiative on the November ballot that would stymie oil companies’ plans, and now the activists are going door-to-door to convince their neighbors to vote for it. South Portland is a relatively quiet place where major news doesn’t happen often, and lobstermen and clammers still make a living on the water. Ed Smith Stadium’s resident bald eagles have survived. In 2010, the eagles’ previous nest built atop the right field ballpark lights was removed by wildlife officials and destroyed to make way for the $31 million stadium renovation.